For a memorable Pigeon Forge get-together with all your family and friends, check out LeConte Bear Plunge. This 3,600-square-foot lodge features Smoky Mountain décor and updated amenities throughout, blending mountain living with the style of the 21st century. You’ll easily accommodate a large group inside this 5-bedroom, 5-bath cabin thanks to its versatile sleeping accommodations for 22. Plan a family reunion, host a wedding party, or enjoy a retreat with friends at LeConte Bear Plunge inside the Sherwood Forest community. Because of its location, LeConte Bear Plunge offers community pool access—and that’s in addition to its private indoor pool, outdoor hot tub, private theater room, and game-loaded rec room! 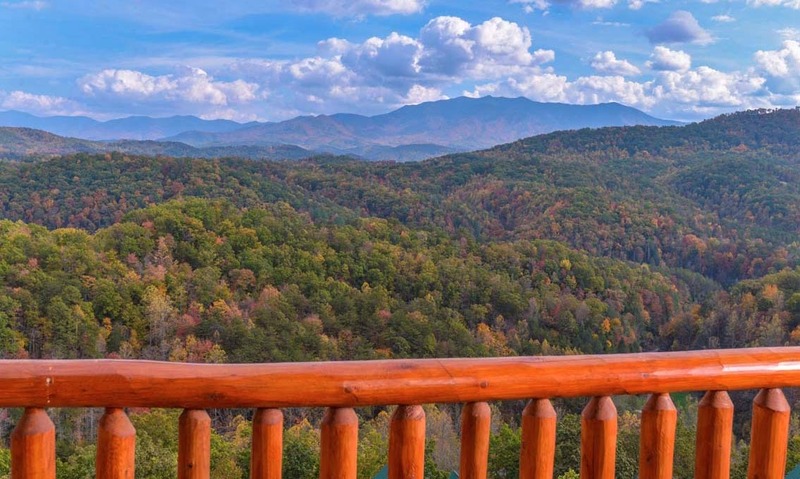 Whether you’re looking to have fun, relax, or be swept away by unforgettable mountain views, you can have it all at LeConte Bear Plunge, conveniently located less than 4 miles from downtown Pigeon Forge! The beautifully stained walls and high ceilings of LeConte Bear Plunge bring a warmth and openness your large group will love. Sit back to enjoy it in one of several seating options, including a full-size couch, a matching loveseat, and 2 matching chairs. 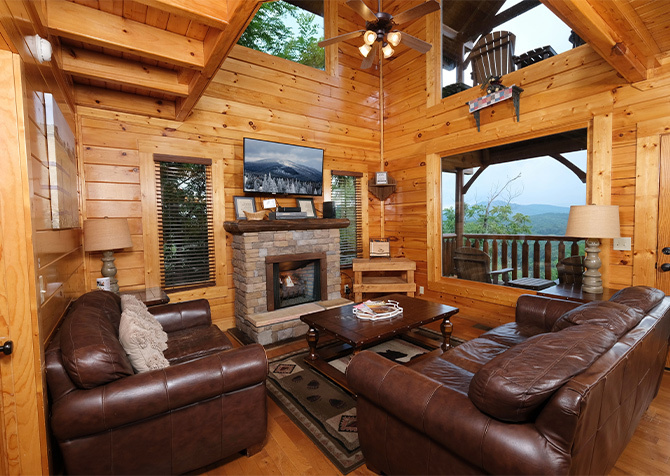 With large windows all around, the LeConte Bear Plunge living room is full of natural light and offers mountain views without even stepping outside onto your rocking chair porch. Enjoy these views in front of your electric fireplace, or turn on the big screen TV mounted above the mantel. Reading lamps, side tables, and a large coffee table provide convenient storage for drinks, snacks, or games. And if you need extra sleeping space, simply close the blinds and convert the couch into a bed when it’s time to hit the sack! If planning a large group getaway sounds intimidating, know that a fully equipped cabin like LeConte Bear Plunge offers everything you need, including a full-size kitchen! This L-shaped kitchen is furnished with essentials for preparing group breakfasts or grab-and-go snacks throughout the afternoon. And it provides all the equipment you’ll need from major appliances to countertop essentials like a blender, coffeemaker, and toaster. If your family or large group has a favorite dinner recipe you want to try, you shouldn’t have trouble finding the right cookware and serving pieces to make that possible. We also recommend checking out popular Pigeon Forge restaurants, many of which are only 3 or 4 miles from the cabin. Look for restaurants that cater, too, and you can bring back a hot meal to enjoy at the large dining table found inside the kitchen. For extra seating, LeConte Bear Plunge also provides a nearby breakfast bar with 4 stools. 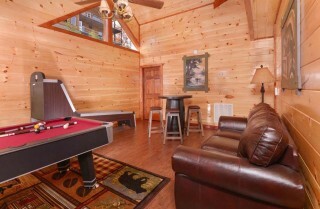 When bellies are full and it’s time to play, head upstairs to LeConte Bear Plunge’s massive rec room! Loaded with games—including a pool table, skee ball game, and multi-game arcade—this large space offers tons of options for indoor play. 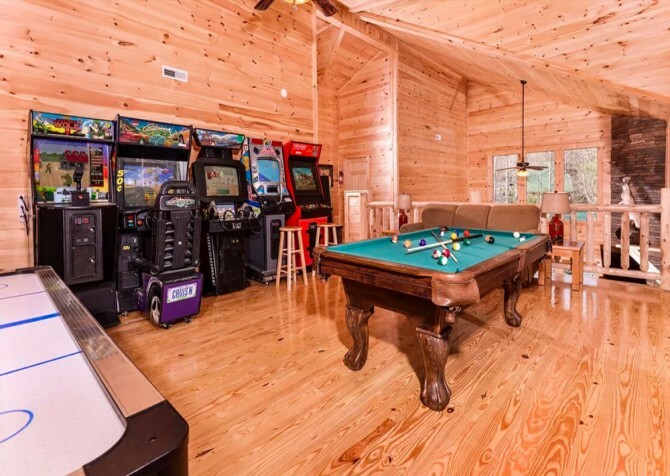 Send the kids to the rec room for a midday escape, or let the guys use it as their poker hangout with the bar table that offers seating for 4. A comfy couch and big screen TV round out the versatility of this space. 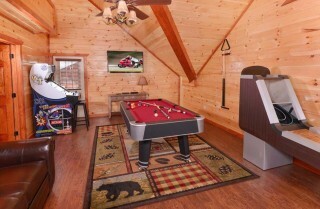 You’ll find plenty of ways to have fun and pass the time on a rainy day with LeConte Bear Plunge’s rec room. And for those who want more gaming options during their stay in Pigeon Forge, don’t miss The Track and other fun attractions on the Parkway. The Track alone features go-karts, mini golf, bumper rides, kiddie rides, and a 65-foot bungee jump! Dark and cozy, the private theater room is another great option for indoor fun inside LeConte Bear Plunge! With a huge flatscreen mounted on the wall, cable access, a DVD/Blu-ray player, and access to an in-cabin movie library, you’ll have endless options for group entertainment during your stay. 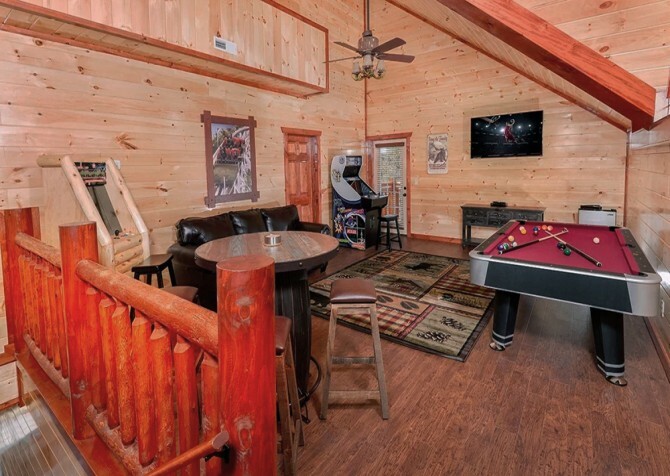 Watch the big game or plan for movie night every night while you’re in Pigeon Forge. You’ll love this room’s theater-style, tiered seating and fold-down chairs with individual cup holders. The only things you need to bring are your favorite drinks and some popcorn! 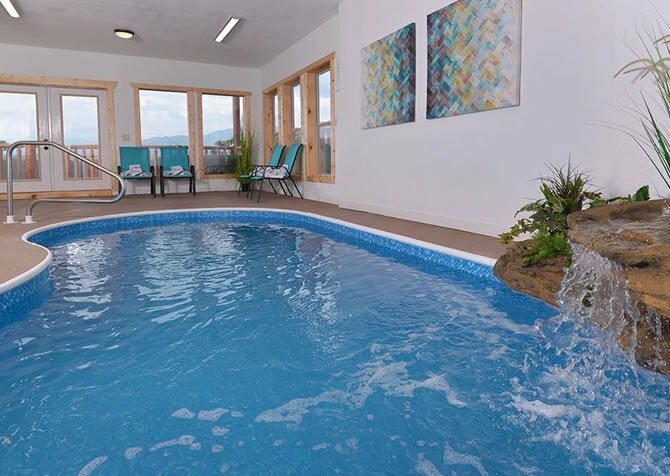 As if a large rec room and private theater weren’t enough, LeConte Bear Plunge also offers a private indoor pool! 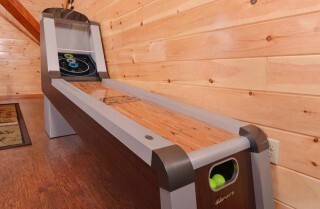 Use this convenient amenity to stay in shape after enjoying a few too many flaky apple fritters at the Apple Barn. Or let the kids get out some mid-morning energy so they’ll be ready for an afternoon nap. While LeConte Bear Plunge also provides access to a community outdoor pool inside Sherwood Forest, having a private pool that’s fully enclosed means you can swim any time of year—and you won’t have to worry about crowds, sunscreen, or finding a seat. 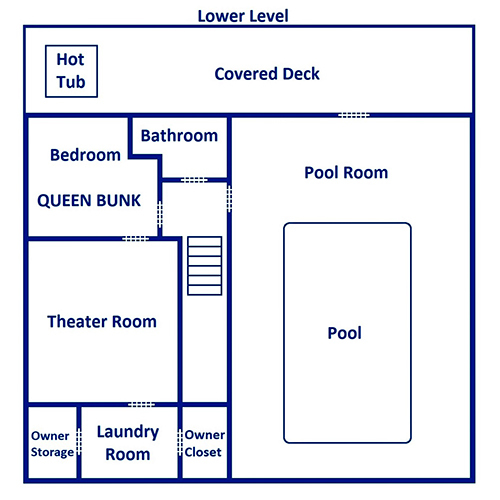 So make the most of what LeConte Bear Plunge has to offer with its indoor pool! To comfortably accommodate your 22-person group, LeConte Bear Plunge offers a variety of sleeping options inside 5 bedrooms. On the main level of the cabin, enjoy 2 bedrooms—the first offers 2 twin-over-full bunks and a queen-size futon, and the second offers a king-size bed. On the top floor, you’ll also find 2 bedrooms—the first with a queen-size bed, and the second with a king-size bed, mountainside view, and private balcony. 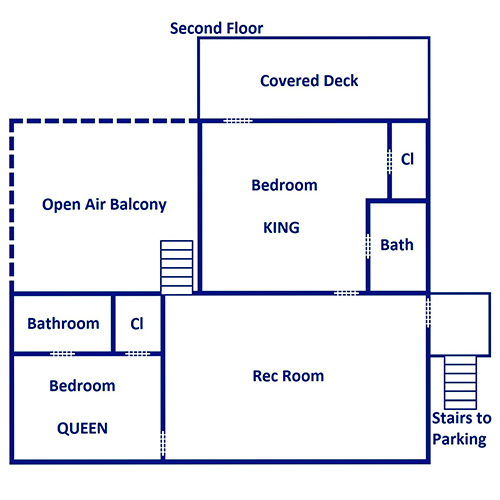 Finally, the fifth bedroom can be found on the bottom floor, where you’ll find a queen-over-queen bunk. Each room comes with its own TV, unique mountain décor, and homey furnishings, giving you relaxing places to unwind after busy days in the Smokies. When you’re not viewing the Smokies from Clingmans Dome (the highest point in the Great Smoky Mountains National Park), your next best option is the rocking chair porch offered by LeConte Bear Plunge! This covered porch offers stunning Smoky Mountain scenery that extends for miles, and you’ll have a row of rocking chairs to enjoy them from. Sip on a glass of locally made wine while you soak up these amazing views, or plan for a relaxing dip in your outdoor hot tub, located on the lower level deck of the cabin. LeConte Bear Plunge also offers a picnic table for quiet dining in the great outdoors and access to a charcoal grill. Family barbecues, afternoon picnics, relaxing soaks—all can be part of your Pigeon Forge experience with a stay at LeConte Bear Plunge! Along with access to a community outdoor pool and hot tub—thanks to this cabin’s location in Sherwood Forest—LeConte Bear Plunge offers these additional amenities: a flat, paved driveway with room for 5 vehicles; a large laundry room with a full-size washer and dryer, ironing board, and iron; and high-speed wireless throughout. 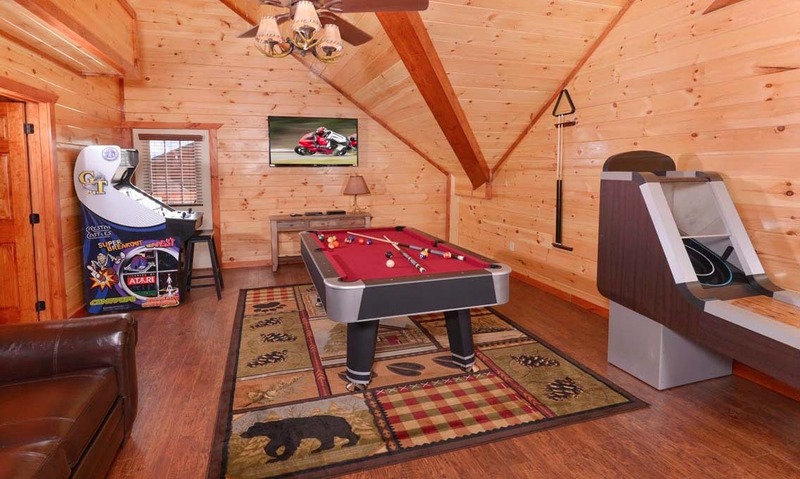 You’ll find all the right amenities at this large group cabin for a comfortable, convenient, and completely exciting getaway to the Smokies this year! Your cabin already provides stellar mountain views, but try a ride on this 200-foot Ferris wheel for a new perspective on downtown Pigeon Forge and the surrounding Smokies. With 2 different ropes courses for everyone from the little guys to adventure-seeking adults, this Pigeon Forge attraction will make for an afternoon of high-flyin’ fun! Challenge your group to solve riddles, find clues, and do your best to escape at this challenging, team-oriented attraction! 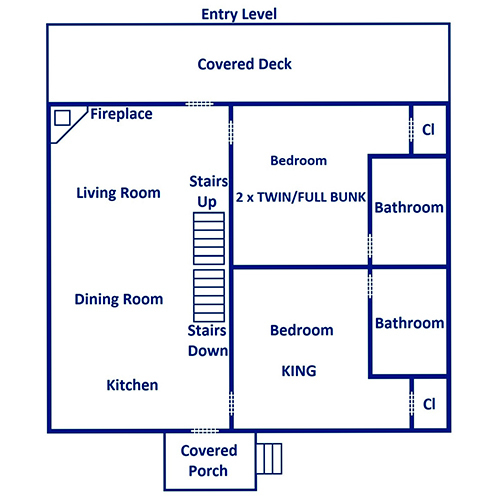 Renters must be at least 25 years old and staying in the cabin in order to make a reservation. "Eleven people ( 6 adults and 5 kids) fit very well. Beautiful views. The pool us bigger than pictures make it appear. Would stay here again." Thank you for the review! We are delighted to hear that your group enjoyed the beautiful views and the pool during your stay at LeConte Bear Plunge and are looking forward to your future stays with us! "We loved our stay at "LeConte Bear Plunge" in Pigeon Forge! This cabin was gorgeous inside and out! The views were breath-taking. No filter was used in my photo. The beds were super comfy and our kids loved all of the games, but most of all the indoor heated pool! They didn't want to leave the cabin. We can't wait to take the rest of our family here."